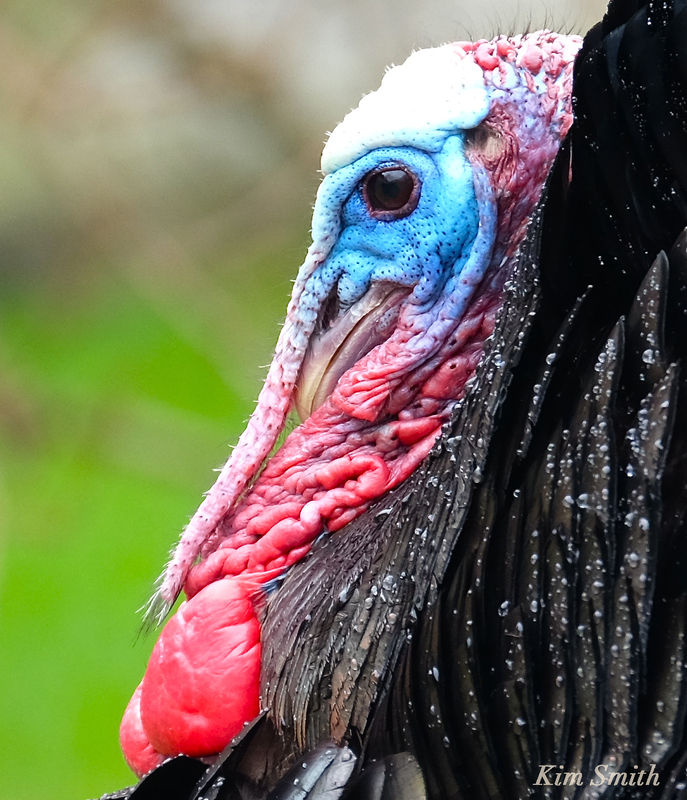 Male turkey’s faces are brilliantly colored red, white, and blue and change color depending on what mood. A solid white head indicates the most excited. 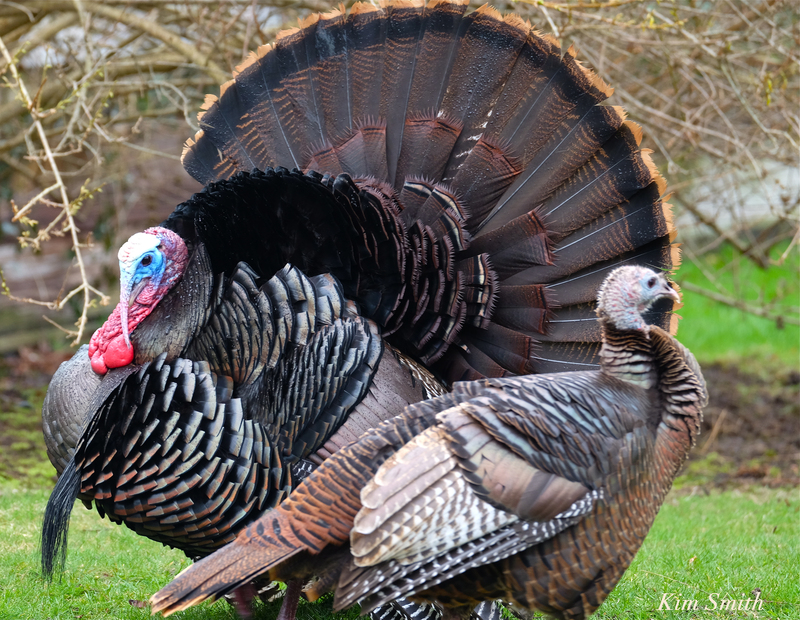 There were three males courting in this group, with one being the dominant Tom. 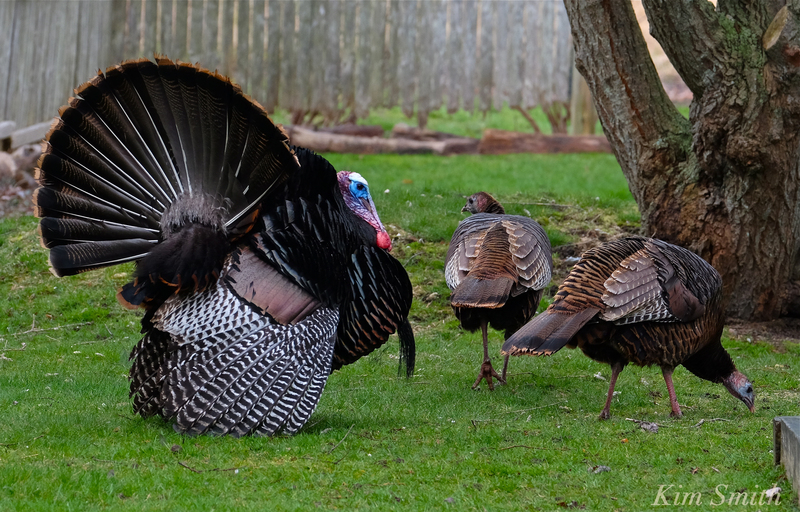 To attract the females, the males were spreading their tail feathers (called strutting) and spitting. Group courtship like this usually takes place after the winter months in March and April, when they are still flocked together. Notice the small light tan colored holes to the right of the eye in both the above photo and the top photo. That is the Tom’s ears with which he can hear quite well. 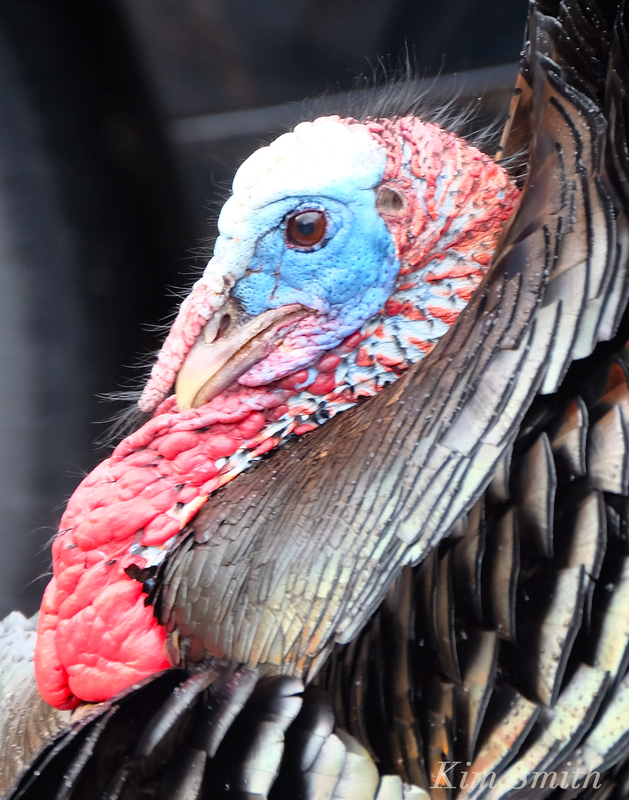 The photo below is not tack sharp so I almost didn’t post however, it demonstrates that this turkey is comparatively more excited as his face is more white and blue than the turkey in the first photo. And you can see the ear quite clearly in this photo, too. 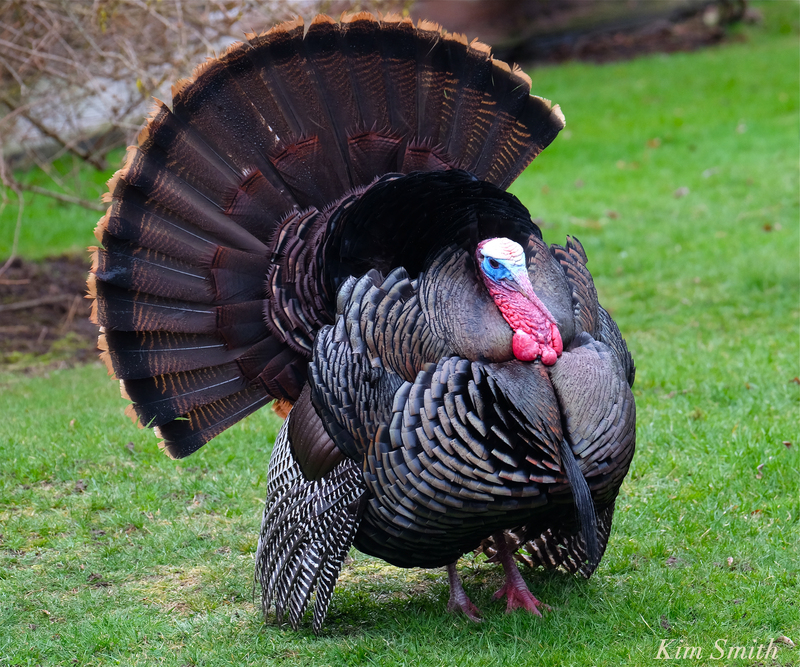 Domestic turkey photo courtesy wiki. 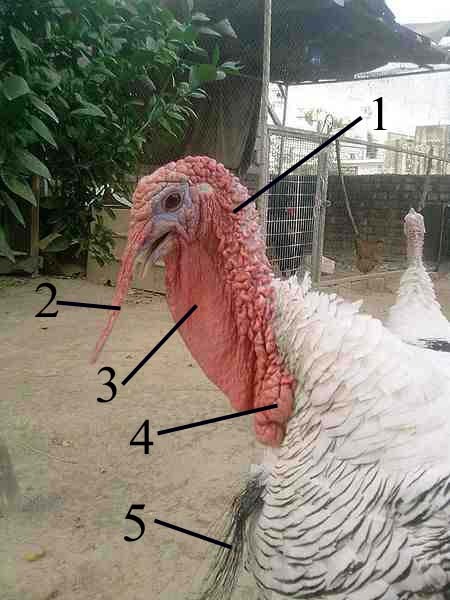 This entry was posted in Birds, Birds of New England and tagged Anatomy of a Turkey Head, Beard, Beautiful Birds of Cape Ann, birds of Massachusetts, birds of new england, Caruncles, Eastern Wild Turkey, hen turkey, Major caruncle, Meleagris gallopavo, Snood, tom turkey, turkey courtship display, Wattle (dewlap), Wild Turkey on April 8, 2016 by Kim Smith. Thank you Bob, can’t wait for the warm weather when I can spend more time outdoors with the new lens. At this time of year I have to keep running back and forth to my car to warm up. Any day now!